Kontron is bringing record-breaking performance per watt to 3U CompactPCI systems with the launch of the longtime available processor board Kontron CP305 with Intel Atom processor, available from Dedicated Systems Australia . The rugged Kontron processor board CP305 features EN50155 compliant reliability and extremely low TDP (Thermal Design Power), soldered processor, chipset and RAM for harsh environments. Equipped with the 1.6 GHz Intel Atom processor N270, Intel 945GSE plus ICH7M chipset and up to 2 GByte of soldered DDR2 memory the Kontron CP305 processor board has a typical power consumption of only 10 Watt. This is less than half compared to earlier generations with identical performance. Designed for reliable operation in a temperature range from 0 to 60°C for convection cooled environments, the new CompactPCI board powers energy critical and in-vehicle mobile embedded applications in the transportation, automation, energy, military and aerospace markets. A version for the extended temperature range is also planned. Despite its rugged low-power design, Kontron’s latest CompactPCI CPU processor board offers a comprehensive set of interfaces: On board the Kontron CP305 are 2 x Gbit Ethernet, up to 6 x USB 2.0, two SATA interfaces, and a CompactFlash socket. 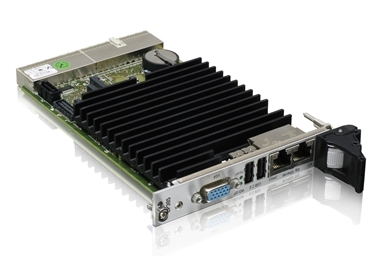 The graphics accelerator, integrated into the Mobile Intel 945GSE Express chipset, provides excellent 2D, 3D, and video features for the VGA connector on the front. The 3U CompactPCI CPU processor board is available as single slot (4HP) or dual slot (8HP). Engineers profit from the 8HP version by additional features including COM, PS/2, DVI on the front for dual monitor operation and a 2.5” SATA hard disk interface to mount a HDD or SSD required for harsher environments. The Kontron CP305 processor features integrated board support packages for Linux, Microsoft Windows XP, XP embedded and VxWorks. Samples of the Kontron CP305 3U CompactPCI processor board are available now. Full production is scheduled for end of 2009.